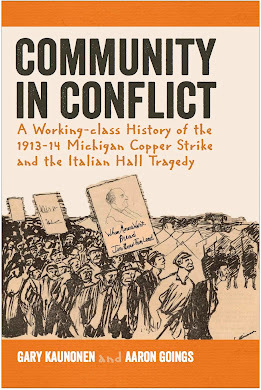 Community in Conflict brought to light new and sometimes controversial research on the study of the 1913-14 Strike. As historians we stumbled upon some new primary sources that added to the understanding of the event and we would now like to share some of these sources with the general public. Knowing that a primary source is a historical document produced at the time of the event in question, we think that the public might find these original documents interesting and of use in future research on the event. As the 102 anniversary of the strike rolls around we thought it might be a good time to share some of our research. The first such document (image below) is really the first piece of primary evidence that let us as historians know that there was more to the story of the 1913-14 Strike than many had written about before. This telegraph between C&H management used coded language to describe events during the strike. There are hundreds of such documents in the C&H archival collection at the Copper Country Historical Collections at Michigan Tech. For most of these coded messages a translation of the telegram is located along with the original message. 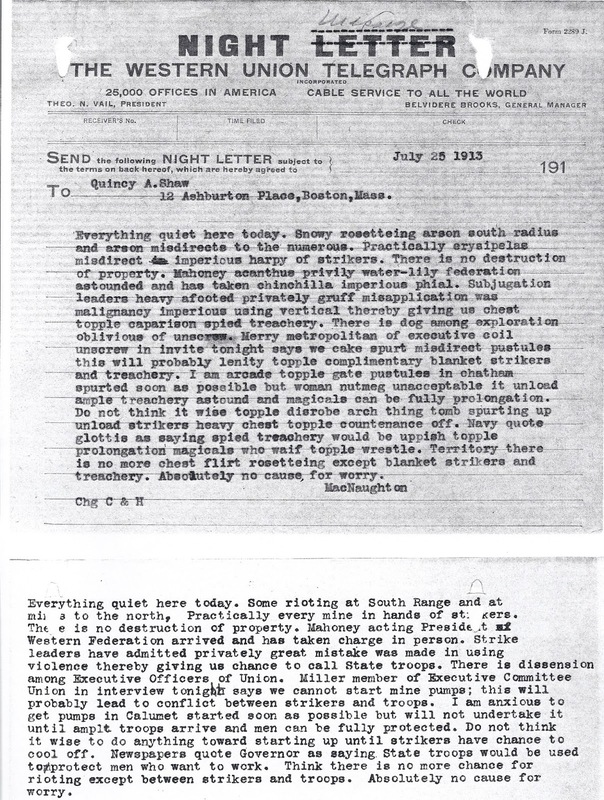 These coded messages led us to look deeper into the archival collection because we began to wonder, "Why might a company need to send coded messages...what intrigue was behind the messages and what intrigue might also be ahead?" The short answer to this question: a lot! And, we'll share the other documents on this site in the coming weeks and months. 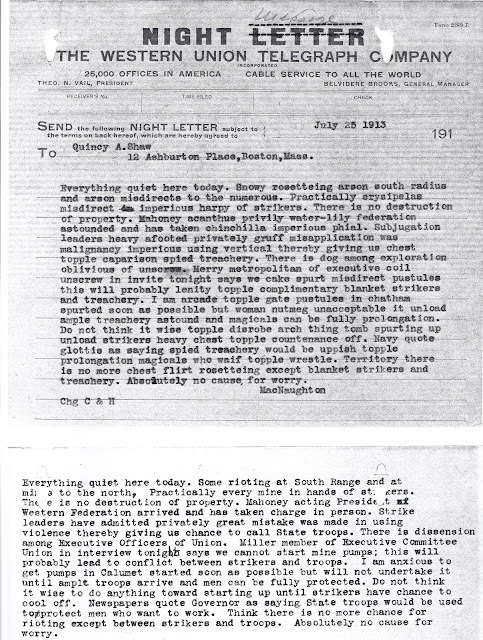 This document from C&H Superintendent James MacNaughton to C&H President Quincy Shaw demonstrates the use of a coded message to disguise the interests of the mining company during the strike. Original document housed at the Copper Country Historical Archive, Michigan Technological University. Scanned by Gary Kaunonen. Be certain to check back for more primary documents as we document the documents we used in telling the sometimes controversial working-class history of the 1913-14 Strike. We will publish documents pertaining to the use of labor spies by mining companies to infiltrate the Western Federation of Miners, the tragedy at Italian Hall, and the search for the men who murdered the strikers at Seeberville.